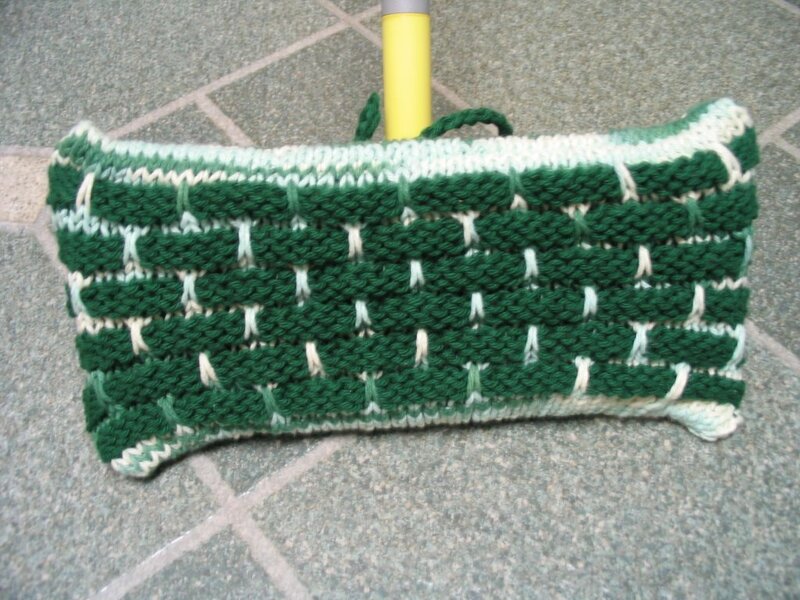 This is my pattern for a knitted toilet paper cover inspired by the "Ball Band" dishcloth. This cover is made to fit a 1000 sheet roll of toilet paper (The kind that is purchased singly, wrapped in a paper) . Edited 8/8/08 You can find the ballband dishcloth pattern at the elmore-pisgah website. Worsted weight cotton yarn. 2 small balls, 2 colors A and B. Most worsted weight yarns should work. With color A cast on 60 stitches with the size 7 (16") circular needle. join being careful not to twist. Repeat these 12 rounds until there are 7 bands. End with 2 knitted rounds of color A. Switch to size 7 double pointed needles, dividing stitches evenly. Break yarn and using large eyed yarn needle draw yarn through the 5 remaining stitches and fasten. Weave all end in. [ hakucho19(at)yahoo(dot)com] and I would be happy to post it in my gallery! Copyright ©2006 hakucho, All Rights Reserved. Oh wow, one is prettier than the other. I just love the first picture, it's the lighting I guess, but it looks so professional. I wish I could make one right now. Sigh. Soooo much I'd like to knit. Thanks so much for sharing the pattern, I can't wait to make a few. I've had a great time browsing through your blog and seeing all the neat things you've made. 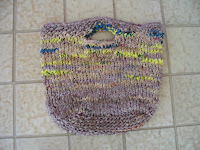 Now I want to make pocketbook slippers and entrelac dishcloths and entrelac felted bags! It's a good thing I've got a huge stash of cotton and wool. Thanks also for the nice comment on my blog. Thanks for the pattern, and the trip down memory lane. I love the white and pastel one the most, but they are all beautiful! And this looks like fun! We can't put our rolls on the holder (our dogs will search and destroy) so this is a pretty way to keep them up and safe. I will make some this week! What a great idea. They all look great. No more undressed toilet paper. Thanks for the pattern. I can't wait to make one of these!! Great !! Will sure catch everyones eye!! Has you ever thought of doing this for a tissue box? Would be great. Email me. I'll try to help you, but I can't reply to you because you posted anonymously. I'm not sure why you can't print the picture. I like the colors you used...pretty colors. Thank you for posting this pattern! We just had our bathroom remodeled and this is one of the finishing touches that was needed. This is an adorable pattern, and I would love to make it into a kooky top-hat! 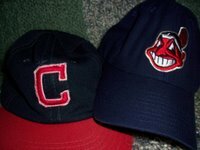 I've never written a hat pattern (and can barely knit one), so I was wondering whether you might convert the pattern when you have some time... If you do this, please let me know at kimnathans at yahoo dot com! Where does the paper come out.? This is a pattern for a decorative cover for your spare roll of toilet paper so no one runs out! You just slip the cover off and place on the roller. It is not a dispenser. It would be pretty easy to knit the BB toilet paper cover on 2 needles, knit flat and sew up the side... but honestly I don't know why you would want to, as you'd have a seam. Seamless is so much better. Knitting with dpn needles is so easy and this would be a great pattern to give it a try at learning how. If you must use 2 needles just cast on the sames number of stitches, but don't join, knit the pattern flat remembering that if you are not knitting in the round you need to alternate your knit and purl rows. When you knit in the round you knit every row to get the same effect. 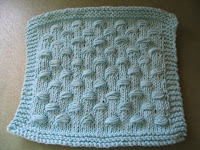 You would adjust the pattern stitch by following the stitch pattern in the ballband dishcloth pattern. Then just sew up the seam. Good luck! 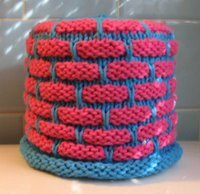 I was thinking of some of the knitted and crocheted gifts my grandma would send, and one of them was a toilet paper cover. Not only do they jazz up extra toilet paper rolls, but they keep curious kittens and toddlers from unrolling toilet paper. Funny you should mention the ones with the doll inside, because that's the kind she would make, and the one I remember had a really big hat. Where do you keep your WIP's?